The race for this season’s South of Scotland League title is really heating up now as the competition moves into the final weeks of the season. Present champions Wigtown and Bladnoch did their chances of retaining the title a lot of good with a comfortable six goals to nil victory over Crichton at Trammondford Park last Saturday. 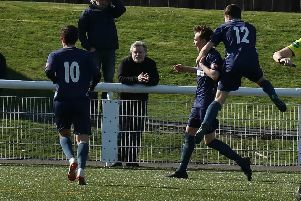 They did not only take the three points but boosted their goal difference that put them a goal and two points ahead of nearest challengers Newton Stewart although following Saturday’s matches the Creesiders still had a game in hand. Wigtown were four goals to the good at the break through goals from Robert Jamieson, Lewis Dunn and a double from Jamie McHarrie. McHarrie went on after the break to complete his hat-trick as his side went nap and an own goal completed the scoring. Challengers Newton Stewart were pushed all the way by neighbours Creetown at Castle Cary Park after going three goals in front but the home side showed their mettle to make a comeback to score twice to leave Newton hanging on at the end of the match. The visitors took the lead in the twenty-fourth minute through striker Robert Middleton to give then a narrow half time lead. Five minutes after the re-start a shot from substitute Allan McKie deceived Creetown keeper Calum Murray and the ball squirmed into the net through his hands to double the visitors lead. On the hour mark Creetown were awarded a penalty with Micky Sutherland missing the target and, nine minutes later, Newton found a third when Johnny Fisher chested the ball into the net. A minute later Sutherland scored with a great solo effort and two minutes after this scored a second when his shot was deflected past keeper Wayne Doyle to complete the scoring. Lochar Thistle beat Fleet Star by the odd goal in three at Maxwelltown High School while Nithsdale Wanderers and Dumfries YMCA had to settle for a two all draw at Sanquhar. This was the YMCA’s first point since coming into South football after twenty one defeats in the league and they have to be congratulated on not allowing their heads to go down following some significant defeats and this was just reward for their efforts. Ebwa put Edusport Academy two up at the break in their match at Hamilton against Heston Rovers with Do Rogerio scoring a third four minutes after the re-start. With eighteen minutes left to play Heston were awarded a penalty which was converted by Grant Learmont after Tiexeira had been dismissed for a second yellow card. The visitors though could not take advantage of their extra man to force any more goals and Edu took the three points in a three goals to one victory.